Accord 10 x 6 Unfinished Wood Sidewall / Ceiling Register Discounts Apply ! Classy wood wall registers feature a vertical design and two way deflection for optimal airflow. Our louvered wall vents can be installed into the ceiling as well with the provided screws. Wood wall registers are made from a North American red oak and come unfinished. Stain your louvered wall vents to match your wood furniture or hardwood floors! The wood wall registers damper is made from plastic and will not rust. Use the louvered wall vents in your home or office and have them shipped straight to your door. ***Hint: To order louvered wall vents correctly, be sure to measure your existing hole opening and not an old register. These 10 x 6 wood wall registers will fit into a hole opening measuring 10 inches wide by 6 inches high. 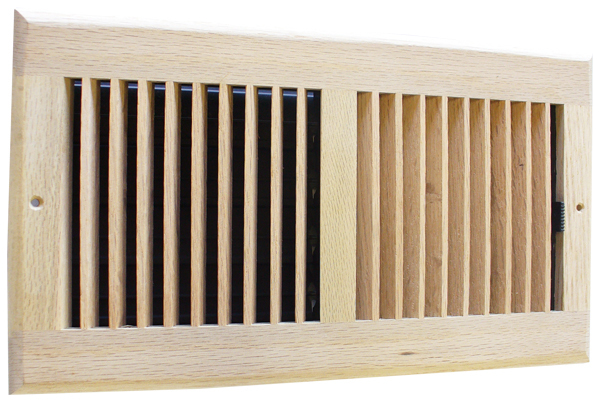 To order louvered wall vents that are prefinished, check out our 10 x 6 and 12 x 6 light oak wall registers. Our wood wall registers are a great opportunity to replace your current sidewall vents with all matching oak ones. Call us to place your order today.